Happy Cat Electric – Our Service Will Shock You! | JIFFY FEET – Southern Fried Awesome! 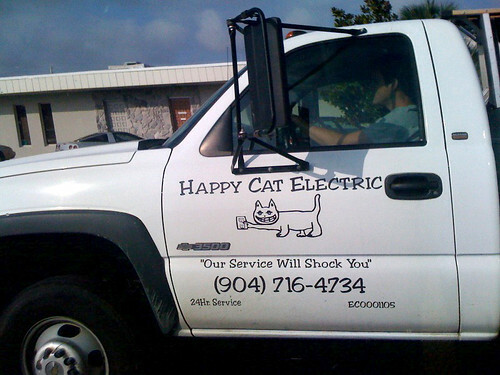 Happy Cat Electric – Our Service Will Shock You!, originally uploaded by jiffyfeet. 4 Comments on "Happy Cat Electric – Our Service Will Shock You!" Haha, that’s my buddy’s company! We love Happy Cat Electric!! This the best electric company !!! Yes, the service will shock you!!! It will be the best you ever had from any electric company out there!!! I have no complaints from Happy-Cat! Good, honest folks! See i knew there would be a good story behind that name!!! I was kinda hoping they had family cat that had his hair all frizzed up that rode around with them. Thanks for your service guys, you need a site to tell your story! ← Pre Halloween Pumpkin Trunk Explosion!! !